Daytime running lights are a feature that some claim helps to increase the visibility of a car to other motorists. Whether or not this is true is a matter of some heated debate. This web presentation does not attempt to resolve this debate. What this presentation does do, however, is give instructions on how to install a daytime running light system on your non-factory-DRL-equipped S2000. 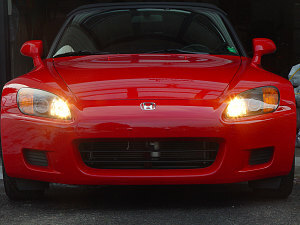 Perhaps you are a US resident and want a DRL system on your S2000. Or perhaps you've imported a non-factory-DRL-equipped S2000 into a jurisdiction that requires them. One difference between the install presented here and the simplest of aftermarket DRL-installs is the manner of operation. The simplest installs simply turn on all of your lights - low beams, park lights, and dash lights, anytime your engine is running. I personally find this distasteful, for a number of reasons: all of your interior dash illumination is always in 'night mode', which makes it hard to read in bright sunlight; on the S2000, I don't like the idea of running the HID low-beams all the time. And I also prefer not to run all of the parking and running lights on during the day either. The installation can actually be done without cutting a single factory-wire or wire-harness! Total cost of parts will be at most $75. A Hamsar 45060 DRL Module (This device is what has the circuitry for running the high-beams at 60% reduced-intensity, plus a bit of other functionality). 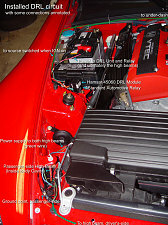 (See the left module in picture 2 below). A standard 12V/30Amp Heavy-duty Automotive Relay. 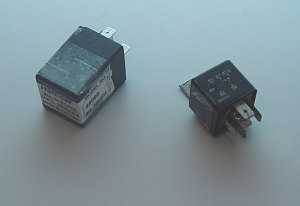 (right module in picture 2 below). In my case, I used a Directed Electronics 610T 30A automotive relay, but you could use any relay that implements the logic you see in my schematic below, so long as the current rating is good enough. 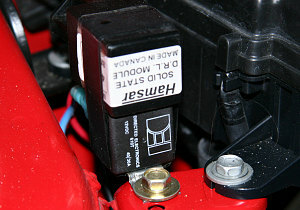 An in-line fuse holder with fuse (picture 3 below). 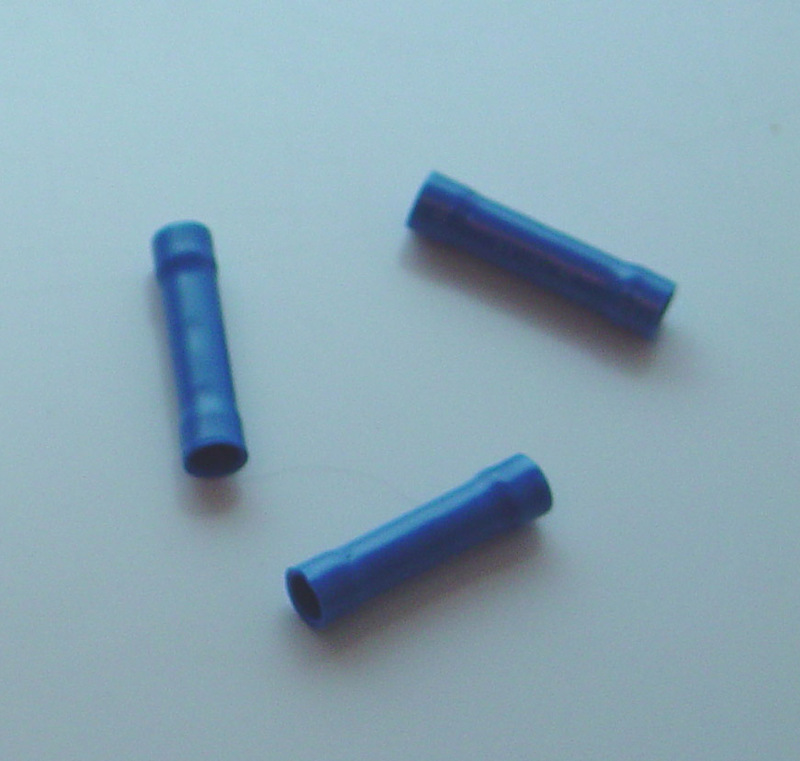 some crimpable ring connectors for attaching to power and ground sources (see picture 3 below). 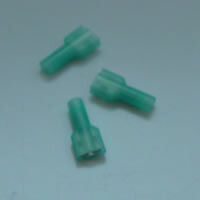 crimpable female tab connectors for attaching wires to the automotive relay. 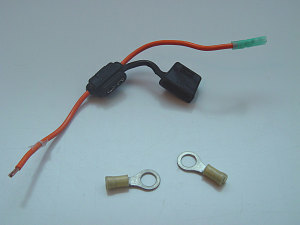 The DRL module comes with a plug and wiring harness, so you don't need connectors for that. 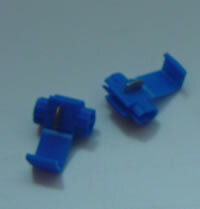 a crimpable tab connector for attaching a connection to a switched Ignition source. some 16-Gauge stranded wire in various colors (makes things easier when you can use different colors). A total of 20 feet of wire should be more than sufficient. some old Honda headlamp connectors off of a junker (picture 1 below). Ask your favorite Honda mechanic or go to a junkyard. 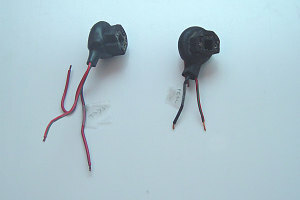 Splice your DRL-install wiring into these connectors; this allows you to disconnect the factory connectors and leave them unmolested. If you don't have these then you'll either have to cut up the factor high-beam connectors or you'' have to find some connectors of your own to fit onto the tabs on the high-beams themselves. 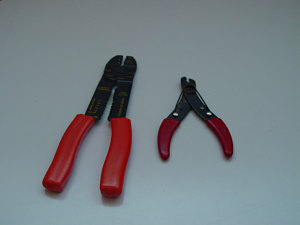 A crimper tool, wire stripper, and wire cutter (see picture 4 below). when the Ignition is activated (ie- key is turned to the 'ON' position), pin 85 on the DRL module is energized. This causes pin 30 on the DRL module to output 60% reduced-intensity power. Assuming the main headlight switch is not in the Low-beam or high beam position, this reduced-intensity power is connected through the relay to the headlamps, and you have reduced intensity high-beam DRLs. when the main headlight switch is in the low-beam position, the headlight relays are activated, and the low beams and all other lights come on as normal; however, this now also energizes pin 86 on the DRL module, causing it to turn off the 60% reduced-intensity power to the high beams. So, the DRLs switch off when the low beams turn on. 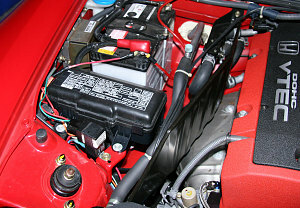 when the main headlight switch is in the high-beam or flash-to-pass position, current flows through pins 85-86 of the relay, causing the relay to activate and causing a connection between pins 30 and 87 on the relay, connecting the highbeams to full 12V power (and causing them to come on at full intensity). NOTE: Picture 14 (at the bottom) is a schematic of the headlamp circuitry with the modifications required overlaid in orange. I've also labelled the wire colors I used in my particular installation. Referring to this diagram often should greatly increase in the understanding of what connects to what. 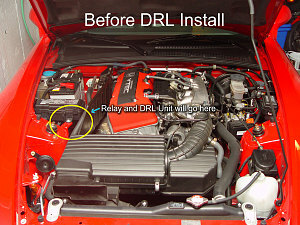 1) I made all of the connections between the DRL module and the relay before installing into the car. I then wrapped the two modules together tightly with electrical tape. 2) Connect the wire going to pin 87 on the DRL module to chassis ground (I used the ground position near the passenger headlamp area). 3) Connect the wire going to pin 87a on the DRL module to power (the '+' battery connector). In case its not obvious, connect at the end of the wire, _after_ the supplied 10A inline fuse. 4) Connect the wire going to pin 30 on the DRL module to pin 87a on the relay. 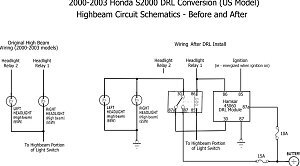 6) disconnect both left and right factory highbeam connectors from the high beams. (see picture 8). 7) on the driver's side, wrap the factory highbeam connector in something weatherproof. It won't be used anymore. The scrounged headlamp connectors you have may have 3 terminals. you are only interested in the left and right connectors. The top one will be unused. 8) for the driver's side highbeam, connect the highbeam headlamp wire that used to connect to the RED/BLU wire on the factory high-beam connector to ground. (I used the ground position near the driver's side headlamp area). 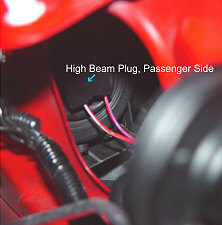 9) for the passenger's side highbeam, connect the highbeam headlamp wire that used to connect to the RED/BLU wire on the factory high-beam connector to ground. (I used the ground position near the passenger's side headlamp area). 10) connect a wire to the [driver's side] highbeam headlamp wire that used to connect to the RED/YEL wire on the factory high-beam connector. Run this wire all the way across to the passenger side of the car and to the [passenger's side] highbeam headlamp wire that used to connect to the RED/WHT wire on the factory high-beam connector. 11) Splice into the wire from 10) and a wire from that splice to pin 30 on the Relay. This wire will be carrying the the full-intensity high-beam current or the DRL half-intensity current, depending on the current mode. 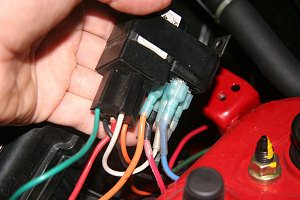 12) crimp a tab-style connector onto the end of a new wire and slot it into the hole on the passenger-side factory high-beam headlamp [female] connector that connects to a RED/BLU wire. 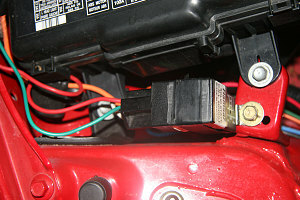 Note: This is the connector that was originally attached to the passenger-side high-beam. Connect the other end of this wire to pin 85 on the relay module. 13) crimp a tab-style connector onto the end of a new wire and slot it into the hole on the passenger-side factory high-beam headlamp [female] connector that connects to a RED/WHT wire. Note: This is the connector that was originally attached to the passenger-side high-beam. Connect the other end of this wire to pin 86 on the relay module. Also, splice into this new wire and connect to pin 86 on the DRL module. 14) Run a wire from the fuse box area under the dash, though a rubber gasket on the firewall (you'll need something to poke a small hole through it), into the engine compartment and over to the DRL module. Connect the wire to pin 85 of the DRL module (see picture 9). 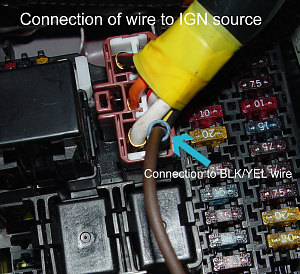 15) Connect the ingition wire you ran under the dash to the BLK/YEL wire in the large connector right connector next to the fusebox. I used a tab-style connector and wedged it in with that wire at the connector (see picture 10). 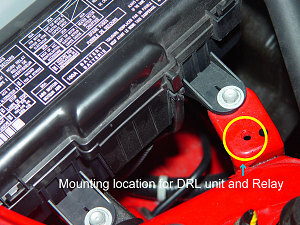 16) bolt down the DRL module/Relay to the indicated mount point (see picture 7). That should be it. Re-check all of your connections, make sure everything is ok. Picture 11 shows the completed installation (although a lot of the wires and connectors are not visible in the shot). 1) re-connect your + battery connector to your battery. 2) verify normal operation of high beams, low beams, etc with the car off. 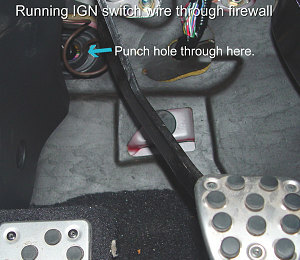 3) insert key into ignition and turn to the 'ON' position. If all is well, the high-beams (and only the high-beams) should come on at low intensity, AFTER ABOUT 5 SECONDS! (built in delay in DRL module to allow you to start the car without the DRLs on). 4) if you now turn on the low beams, the DRLs should go off. 5) high-beams should come on at full-intensity when selecting the high-beams or flash-to-pass on the headlight switch. If all this works... Congratulations! The picture below shows the DRLs in action. The two schematics below outline the wiring changes that are involved in this installation. The first schematic shows a before and after overview comparison of the electrical circuits involved. 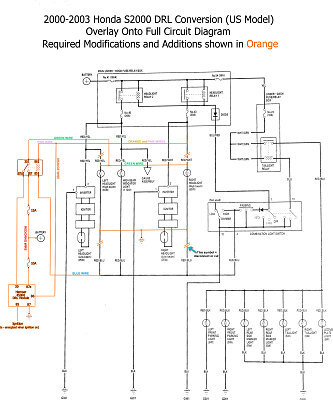 The second schematic shows the full original schematic of the S2000's headlight wiring, with the modifications we've made overlaid on top in orange. I recommend you use the second schematic as a helpful guide as you make these modifications. I'd like to thank my friend Markus for helping me out with this little project. I may have been able to get it done without him, but not without a lot of extra time and a bit of doubt.